It’s like Mike never left! Chris Christie continues to go on his farewell tour as Governor on New Jersey. Talk about tapping out on the job. It looks like he doesn’t even care about the state of New Jersey anymore. It’s amazing to see because I truly thought this guy would’ve had a cabinet position because of his work during Hurricane Sandy. A couple scandals later and the majority of his own state wants nothing to do with him. Chris Christie: I just closed a beach on the busiest weekend of the year so my family could have privacy. With Mike Francesa leaving WFAN at the end of the year, it’s officially tryout season. Mike always goes on vacation for the whole summer (“I gotta bet da ponies at sartoger”) so fill-in hosts are nothing new on the Fan. However, this summer is extremely important because the station is holding tryouts to find replacements for The Zaun’s coveted afternoon drive spot. The DMR are all Mike guys so we’ve been guessing like the rest of you as to who will take over. LTS and I have especially went back and forth as to who takes over and we both think the time slot will be split up into two shows. We’ll get into specifics in another article, but in regard to Chris Christie, I think today solidified that he’s going to get a job at WFAN once his time is up as governor. What do we love Mike for? His outbursts, the prank calls, his arrogance, his ego, his presence, and the fact that he only cares about his opinion. Say what you want and don’t apologize (unless it involves saying orientals). This is exactly what Chris Christie is trying to do. Someone goes after your weight? Call them a bum and a communist. WFAN needs to somehow find a way to keep Mike’s audience when he leaves and more importantly, keep up his ratings. Christie might be the guy to do it. He’s a Cowboys and Mets fan in a NY market. He fights will callers and calls them bums. I guarantee the phone lines were jam packed today. Callers will have a field day with Christie. 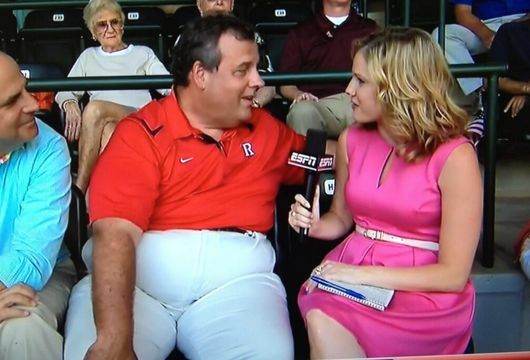 When the rumor first came out of Christie taking over for Mike, I didn’t take it seriously. Now? WFAN is 100% going to hire him.